Recycled forest products, coir, perlite, dehydrated chicken manure, composted chicken manure, hydrolyzed feather meal, peat moss, kelp meal, worm castings, and bat guano. Specially designed for raised bed and large container gardens. 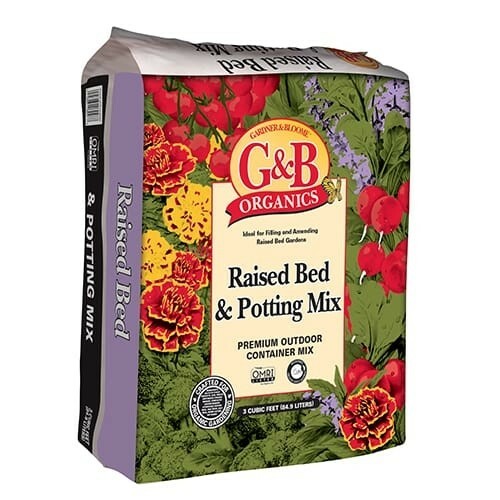 G&B Organics Raised Bed & Potting Mix comes ready to use for the perfect application for your raised bed projects. The slightly woody texture adds the ideal combination of porosity and moisture retention to the solid. Additional coir and peat moss ingredients offer increased moisture-holding capacity making this product great for container gardens too. Added organic fertilizers like composted chicken manure, kelp meal, and bat guano ensure both an immediate and extended release of nutrients to keep the soil healthy.